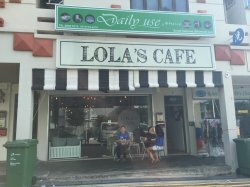 The cafe is located in the middle of a row of shophouses and is just across the street from the MRT station. Although we arrive about 23 minutes before the opening timing, we are not the first in queue for the cafe to open. The queue stretches quite long by the time the cafe opens for business. 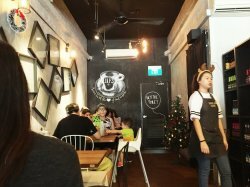 The cafe is packed the moment it opens. 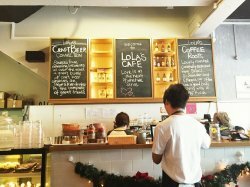 4The cafe is quite small in size and tables are placed quite near to each other. Beautiful arts decorated the walls. Orders are taken at the tables. Only cash and NETS are accepted here. There is no GST and service charge here. The bread is very soft and pillowy. Topped with the ham and avocado spread, it tastes simple and great. The eggs are cooked just nice, with nice thick yolk flowing out like lava. 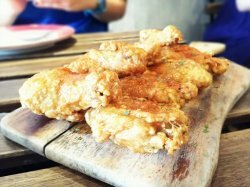 Served on a wooden chopping board, the chicken wings are very crispy on the outside and juicy and flavourful inside. Topped with honey and paprika, it gives a sweet and spicy in the same mouthful. 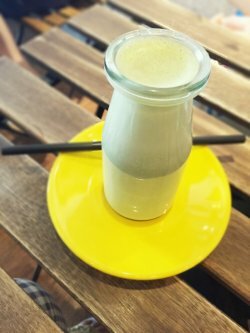 The drink is served in a small milk bottle. It tastes similar to Starbucks' version but not as sweet. 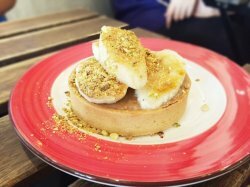 The sliced banana on top of the tart is soft and topped with a hard caramlized crust. It does not too taste too sweet and has a nice texture. The filling inside is thick and creamy. It has a flowery taste with a strong hint of Earl Grey taste. I am quite disappointed with its hard and dry tart crust. It is difficult to cut through with the metal spoon. 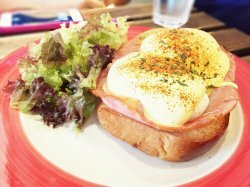 Overall the food is delicious and served quite fast from the limited menu. As the place is quite packed with families on Sunday, the place is quite noisy with children crying in the background. Although there is always queue at the door, I feel that the turnover is quite fast.